Headlights are the marvelous invention that have enabled night driving and made the road a safer place to be. However, headlights cause glare, which can be both discomforting and dangerous. To understand the discomforting and sometimes dangerous glare of headlights, you must first understand how a headlight works. Below is a list of the major types of headlights currently used, and an explanation of how they work. The oldest, and still rarely used, form of headlights are conventional incandescent bulbs, which use a tungsten filament. The air in the bulb is made up of nitrogen, argon, or krypton, which are all inert gases to prevent the wearing of the filament. These produce light by passing electricity through the filament, which heats it up to high temperatures and glows, a process known as incandescence. It emits a range of frequencies of electromagnetic radiation, the peak being in the infrared, or hot range. The "spectral density graph" is a smooth curve, because it is a "black body radiator". Because the peak is in the infrared range, this bulb emits most of its energy in the form of heat, making it very inefficient. The average incandescent bulb will run for only 1000 hours. Currently the most common form of headlights are halogen bulbs. These are still incandescent bulbs with a tungsten filament. The only difference is that the air inside the bulb is a halogen, such as iodine or bromine. This doubles the lifespan of the bulb to approximately 2000 hours on average, by using a specialized reaction process that recycles the tungsten in the filament. 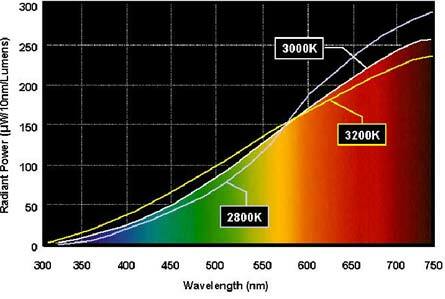 They are also more efficient than standard incandescent bulbs, as the peak frequency, although still in infrared, is closer to the visible light spectrum, allowing more of its power to be converted to visible light. The newest form of headlights are LED lights, so they are not yet in high-volume production. They use several light-emitting diodes to provide a monochromatic light, in whatever color you desire. Research is also being done on the use of white LEDs. LEDs are very rare on the road today, as they only exist in aftermarket automotive products. One of the newer form of headlights are HID bulbs, which use xenon. These bulbs do not have a filament, but rather send a large amount of electricity through the gas creating an electric arc which emits the light. On the "spectral density graph", there is a small curve resembling a black body radiator, creating the whitish light component. 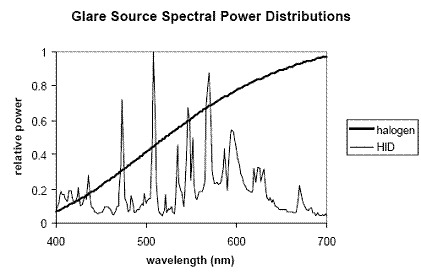 However, most of the visible power is emitted along spikes, the largest being in the higher wavelengths (see chart: 405nm, 435nm, 475nm, 509nm, 548nm, 569nm, and 592nm). These are some of the major "spectral lines" of the element xenon. This and other smaller spikes add to the bluish component of the light emitted. HID lights appear as a bright bluish white. Because of their intensity, HID lights produce the highest amount of glare of all the headlights. In Component One, Part Two, we reference a research grant that is related to the glare produced by HID lights.